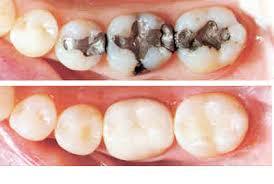 Bonding is an obvious improvement over unsightly silver amalgam fillings. It’s durable and can potentially last for many years with the right home care. It is a safe, affordable, and attractive solution for many dental problems. Most of us will need a dental filling at some point in our lives; the good news is that we no longer have to live with the unsightly look of metal amalgam fillings. Composite resin is now the material of choice for dental fillings. Besides its more esthetically pleasing appearance, it offers numerous other benefits for patients including requiring less natural tooth structure to be removed than amalgam fillings, which allows Dr. McKenzie to maintain as much of your natural tooth as possible.